I touched a bit on this in Tuesday’s blog, but this topic deserves a blog unto it’s own. First of all, my favorite pie-baking waitress is back on One Life To Live – Noelle Ortiz of course and that’s good news in itself. But there’s more good news about her portrayer, January LaVoy, who, by the way, is so warm and genuine….she’s an amazing person as well as super talented. And being a good person in this crazy world counts for a lot as far as I’m concerned. January is co-starring in “Home” at the Signature Theatre Company in New York City until Jan. 4. She co-stars with Tracey Bonner and Kevin T. Carroll. Since I was spending my Thanksgiving week in Conn., my husband, my aunt and I took the train in to New York City to see a play – and when I found out that January was in “Home,” I decided that would be the play to see. Below is a description of the play, which is a revival of the original production. Home, which received a 1980 Best Play Tony nomination, is the tale of one man’s struggle to stay true to himself amid a rapidly changing and turbulent America. Leaving behind his family’s farm in North Carolina, Cephus Miles seeks refuge and prosperity in the North. 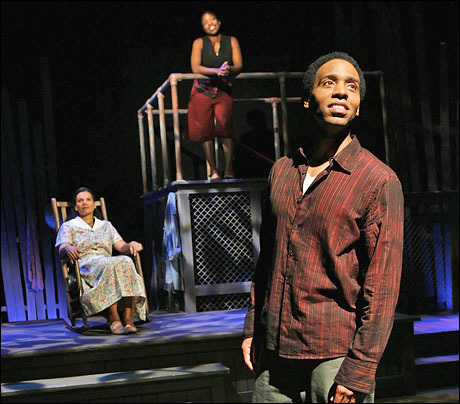 Three actors portray more than 25 characters over the course of Cephus’ epic journey from adolescence to adulthood, spanning the 1950s through the Vietnam War and Civil Rights eras. The three of us were awed by the entire performance. All of the actors were incredible. Kevin T. Carroll as Cephus brought the audience through a gamut of emotions – funny to sad and everything in between. January and Tracey did a spectacular job of playing a variety of characters and performing an array of sound effects that were so amazingly real. After the performance, the three of us met January, Kevin and Tracey – all of whom were so unbelievably warm and welcoming. Do we look like we’re having a good time, or what? Tickets are available on Signature’s website at http://www.signaturetheatre.org/ by phone at (212) 244-PLAY (7529) and in person at the box office. I highly recommend the production. Tagged Cephus Miles, Home, January LaVoy, Kevin T. Carroll, New York City, Noelle Ortiz, Off Broadway, One Life to Live, Paris, Signature Theatre Company, Tracey Bonner, TX.